After unwrapping the Focus RS recently, Ford made promises to come with something more sportive and powerful. It looks like with Ford Fiesta ST200 2017 they fulfilled it. Housed with a powerful engine and adorned with exterior that makes it look different, the model is speculated to gain numerous accolades by the buyers. 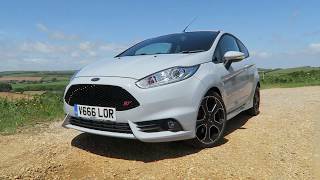 Let us have a look at the review of Ford Fiesta ST200 2017 to know in detail about it. The first thing that you might notice, entering the interior of Ford Fiesta ST200 2017 could be the charcoal colored Recaro seats with contrast silver stitching. The essence of silver can also be noticed over the seat belts while the scuff plates get the accent of illumination. Alongside you can see the revamped door panels with a mirror and mirror controls and a pull handle. The doors also receive storage pockets and a beefy pull handle towards the front. The driver gets same instrument cluster hidden behind the steering wheel however the control knob for infotainment gets a larger shape while the ST200 badge over center console, below climate control panel and in front of gear shifter, rounds up the interior details of Ford Fiesta ST200 2017. 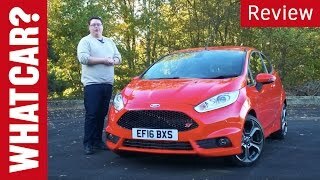 The exterior of Ford Fiesta ST200 2017 doesn’t receives much changes. However the model does receive the blend of black over the grille, air dam louvers, mirror arms, corner vents and yes the 17” alloy wheels that make the entire package. The dark package adds commendably to the looks of the model, while the red brake calipers sneaking through the wheels further add to the sportive stance. Not only these, but the tuned dampers and springs make the ride more comfortable and also lower the ride height that lessens the gap between arches and wheels. 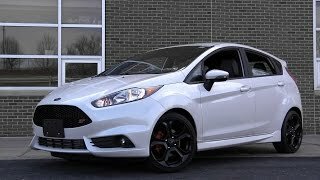 Thus rounding up the exterior details of Ford Fiesta ST200 2017 all I would call these minute changes is that they add to a sportive appearance. 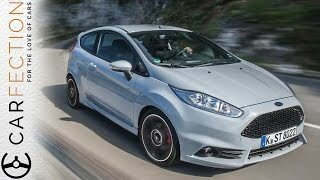 Powering the Ford Fiesta ST200 2017 is a 1.6 liter EcoBoost four cylinder engine cranking total output of 197 hp and peak torque of 290 nm. 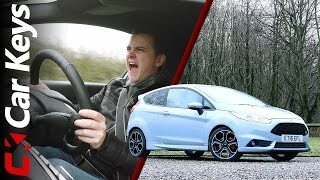 With this power rumbling the17-inch wheels, the top speed of Ford Fiesta ST200 2017 touches the mark of 143 mph.